In the Global Volcanism Program’s volcano data layer, red triangles dot the western United States, indicating active volcanoes over the past 10,000 years. The layer includes popup balloon information for each volcano, such as Colima Volcano in Mexico. Image courtesy of Google Earth. Launched publicly in June 2005, Google Earth has become a tool for scientists of all disciplines from around the world to watch the planet in motion, as volcanoes erupt, earthquakes rumble and snow and ice cover recedes (see Geotimes, December 2005). Now, the user-friendly Google Earth is increasingly becoming a meeting place for scientists and nonscientists alike, offering a way to connect and share data with each other on an unprecedented scale. The nonscientist world has embraced Google Earth as well, marveling at its detailed images of the planet or playing Google Earth chess on a giant board that is superimposed on the global map. Meanwhile, many amateur (and professional) scientists are taking advantage of how easily the software allows them to share their own data files — consisting of “layers” of latitude and longitude data, photos and other information — with the entire Google Earth community via the public-access bulletin boards. Thanks to these contributors, tracking worldwide objects, from meteorites to ancient burial mounds is only a few clicks away. Google Earth is becoming increasingly recognized by many scientists, however, as far more than a handy map or a pretty toy. They anticipate that it, and other such virtual globes, could provide unprecedented access to the planet’s most-hidden mysteries. Some suggest that it may even help save lives. In 1989, a KLM flight flew into a thick ash cloud spewed 14,000 meters into the atmosphere by Alaska’s Redoubt Volcano and lost power to all four engines before the pilot managed to restart one engine and land the plane. That harrowing incident threw the importance of monitoring Alaska’s many active volcanoes into focus, says John Bailey, a remote sensing volcanologist at the Alaska Volcano Observatory (AVO) in Fairbanks. Twenty thousand passengers and $1 billion of freight pass over the Alaska region every day, which contains about 100 active or potentially active volcanoes. “That’s not a good mixture,” he says. In the latest edition of the Google Earth software, users can also watch in real time as plumes and thermal anomalies develop. A new feature, developed within the past year, adds a fourth dimension — time — to many existing datasets. In addition to the natural hazard community, scientists studying the effects of climate change and rapidly disappearing snow cover and sea ice have found that feature of particular interest. Bailey and his team have become “ambassadors” for virtual globes in the earth science community, he says. At the American Geophysical Union’s (AGU) annual fall meeting in San Francisco in December, he helped organize a session focusing on earth science applications for virtual globes, including both Google Earth and NASA’s “World Wind” geobrowser. The session drew earth scientists from diverse fields, people who “otherwise would have had no contact” and “need to be communicating,” he says. Both Google and NASA have embraced the connection, Bailey says, sending representatives to attend the AGU session and talk with the earth scientists directly about ways to improve the functionality of their programs — which scientists and software developers alike found helpful. “The developers are hearing from the people who are really pushing their tools to the limit,” he says. The volcano community, like the snow and ice community, is taking a leadership role in fine-tuning the capabilities of virtual globes to their own needs. Unsatisfied with the existing data on volcanoes that Google developers had initially built into their software, volcanologists at the Smithsonian Global Volcanism Program (GVP) created a definitive layer for volcano data around the world, which Google has now incorporated as a new built-in data layer, updating the information periodically by linking back to GVP’s server and vast database of volcanoes that have been active in the past 10,000 years. 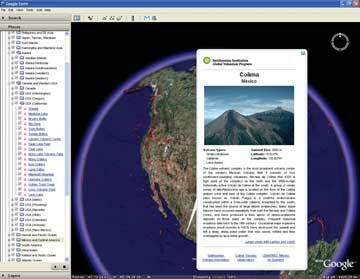 Other virtual globes exist in addition to Google Earth and World Wind, including ESRI’s ArcExplorer, notes Edward Venzke, a volcanologist at GVP. “But Google Earth’s penetration with the public is unparalleled.” That may, in part, be because it still holds some fascination as a kind of toy, even for scientists: While describing GVP’s work with Google Earth, Venzke demonstrated the program’s power, using a joystick controller to zip across a virtual planet dotted with red triangles, denoting volcanoes. “Using a mouse with Google Earth is so two months ago,” he says. Venzke, and others at GVP, have been compiling volcano data from multiple sources over the past 30 years. By creating a Google Earth volcano layer, he says, the public now has easy access to the Smithsonian’s massive database of volcanoes. That database, accessed by clicking on any red triangle, includes not only a volcano’s location, but also its history, appearing in a popup balloon. “The high number of ‘balloon hits’ — 1,000 per hour — underscores the public’s fascination with volcanoes,” as well as how virtual globes can be useful in bringing scientific data to them, says Lee Siebert, a volcanologist at GVP. Amateur and professional scientists are also taking advantage of the freely available software, creating their own databases of information on anything from meteorites to mineral deposits, and uploading them to an electronic community bulletin board. One “famous” figure in the Google Earth community, who has helped to stretch the applications of the virtual globe to their limits, is a Russian geographic information systems (GIS) specialist named Valery Hronusov, or “Valery35,” Bailey says. “Everyone has been amazed at the stuff he does.” Among other inventions, Hronusov has created a way to overlay large aerial photographs or alternative maps onto the scenery, and has taken advantage of the new time feature to create animations of wildfires across the planet. At the moment, Google Earth is “leading the way just because of how it’s coming to the public consciousness — it’s the one that kind of forced the point,” Bailey says. That same popularity makes it very appealing to geoscientists, because it offers them a unique way to communicate with an interested but often bewildered public, he says — a topic that has been of increasing concern for scientists of all disciplines.